Get up close to Cannabis Plants! Join Happy Travelers Tours in our luxurious Sprinter bus as we roll through the beautiful and historic Sonoma Valley and the Valley of the Moon. We are on our way to our Mountain Top Grow site on top of the Mayacamas Mountains. Our “Sip-and-Sniff” Experience where we taste wine and compare cannabis flowers, looking for the similarities in aroma and complexity. Talk with a Master Grower and get up close to the plants. 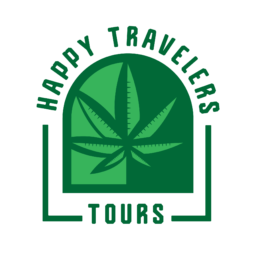 Also at our Cannabis Camp is a personal Budtender Service where Guests can purchase and consume cannabis products from a licensed mobile retailer.